That depends on the brand of watch you have. For most watches, the model number will be on the back or side of your watch. Sometimes it will be on the inside of the back case and you’ll want a jeweler to remove the back, find the number and replace the back. 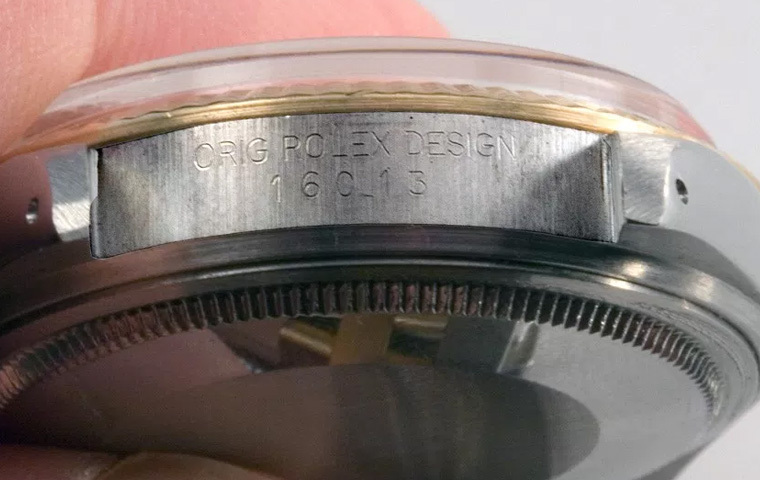 Rolexes are different than all the others. So we’ll start with them and then go through some other common brands. Remove the watch band (don’t worry, you won’t cause any harm) Find the 12 o’clock side of the watch and look between the lugs. The Model Number will be engraved there. But NEVER look at the 6 o’clock side, because that’s a completely different number. The original paperwork is best. You want the Model Number, not the serial number. If you don’t have the paperwork, look on the back of the watch and usually, you’ll see two numbers. The one on top (or sometimes the only number) begins with a letter, not a number. That is the Model Number, the one you want. In rare cases, the Model Number will be directly above the displayed movement on the front. Just look on the case back and the Model Number will be right there. If you still have the paperwork, look for the same model number but with extra numerals added. These describe the design variation of your watch and that information will be helpful to us. Sometimes there is also a chronometer certificate, and this will have a letter followed by 5 numerals. If you have that, tell us the Model Number as well as that number. Look for a 4-digit code on the rear case. On the paperwork, you’ll find the same 4 digits, but the letter “W” will be in front of them. See a jeweler because the model number is inside the case back. Don’t try to remove the case back yourself. On IWC watches, the Model Number is called the Case Number. There may also be a Movement Number. Record both.